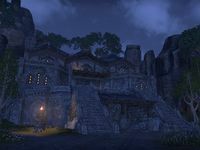 When Hakkvild drove the Orcs of Yashnag's Kingdom out of Falkreath in 2E 467, the exiled Orsimer came east to establish Forsaken Stronghold. But the last Orcs died in 563 after they were visited by a merchant infected with Knahaten Flu. Forsaken Stronghold is a large player house in eastern Bangkorai.